← First Bloom – Triangle Gardens! 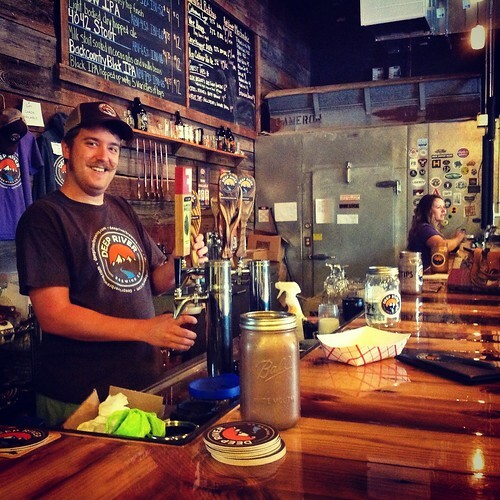 Deep River Brewing Company opened in Clayton back in April 2013 and is touted as Clayton’s first “legal brewery”. The brewery and taproom is the creative passion of husband and wife team Paul and Lynn Auclair. Together they have created what is quickly becoming one of my favorite local breweries. The brewery, located just off Main Street in downtown Clayton has a great tap room that is open Thursday through Sunday. 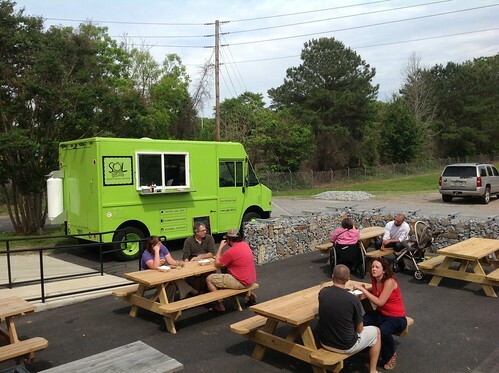 It is a great place to relax, enjoy a pint, and grab some food from a gourmet food truck. I took the scenic 30 minute drive from my home in North Raleigh down to Clayton earlier this summer to visit the brewery for the first time. 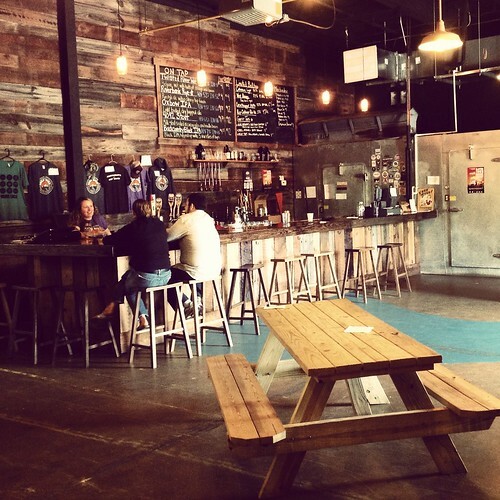 Inside is a great open space with high ceilings and a cool rustic bar to perch at and enjoy your beer. There are also a few large picnic tables and old whisky barrels used as tables providing providing additional indoor seating. Deep River keeps a variety of their beers on tap ranging between $4-$5 a pint and they even offer other local beers on a guest tap (which I always think is great). On my last visit they had Fullsteam Brewery’s Summer Basil on featured on the guest tap. You can purchase a pint, try a sample flight, fill a growler, or buy one of their several canned beers to take home with you. I’ve been to the brewery twice now and have sampled their Twisted River Wit, Riverbank Rye-it Pale Ale, and the Double D’s Watermelon Lager. I enjoyed them all, but I think my favorite so far is the Rye-it Pale Ale. They also have several others beer offering ranging from a Black IPA to the 4042 Chocolate Stout. You can see a full list of their beers here. Another thing I lover about the setup at Deep River is the additional picnic table seating outside. The picture of the outdoor seating area above is from earlier this summer. A few weeks after I took it they installed a beautiful wood bar top along the rock wall the encloses the outdoor seating section. 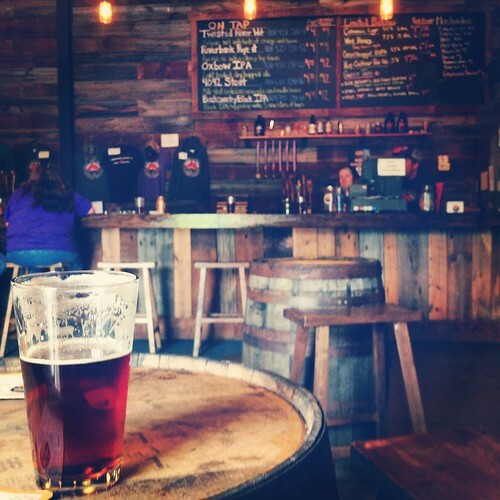 On the weekends you will typically find people playing corn hole, enjoying live music or grabbing lunch or dinner from one of the scheduled local food trucks. You can see the monthly food truck schedule here. I highly recommend paying a visit to Deep River, but if you don’t have a chance to go out to Clayton you can still find their beer for sale in several Triangle bars. 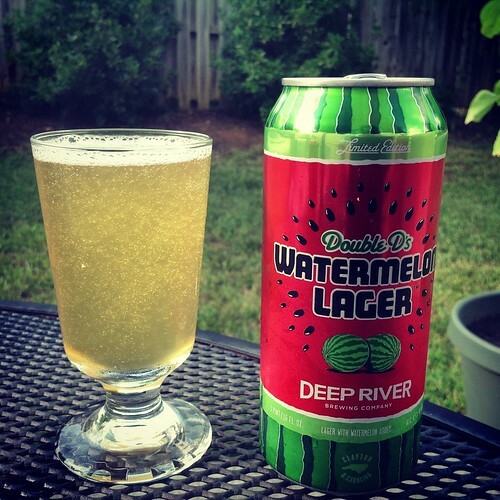 Deep River has also started a canning line for several of their beers and they can now be found on the shelves of many of the local bottle shops, Whole Foods, Harris Teeter, and Weaver Street Market stores. 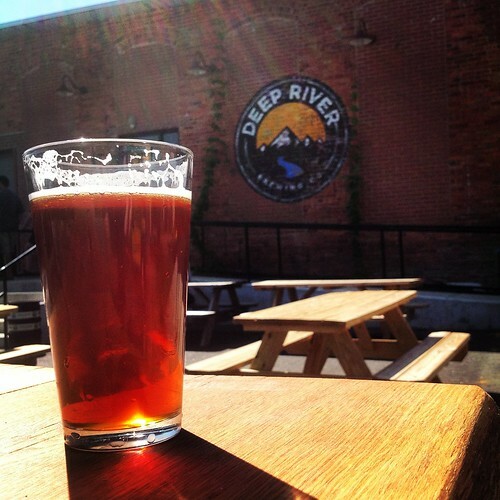 The Deep River taproom is open Thursdays 5-9pm, Fridays 4-9pm, Saturdays 1-9pm, Sundays 1-6pm. Tours by request Thurs-Sat. One thing I like about Deep River, the ability to reward yourself with a beer after traveling on the Neuse Greenway.